A highly sought after item, this beautifully hand crafted work of art is a perfect gift for just about any occasion. Unlike, the majority of music boxes available today, this particular item exhibits several key attributes. The first noticeable feature is its shape. Scaled slightly smaller than your traditional grand piano, this music box displays the various curves and fine details typically found. Crafted to incorporate even more details such as individual black and white keys and stand. It's featured in the natural wood tone to emphasize its quality craftsmanship. Located on the top lid, you'll find the, a subtle but gorgeous wood inlay artwork of "sheet music ". Entirely handmade in Sorrento, Italy, you know only the finest quality materials were used. 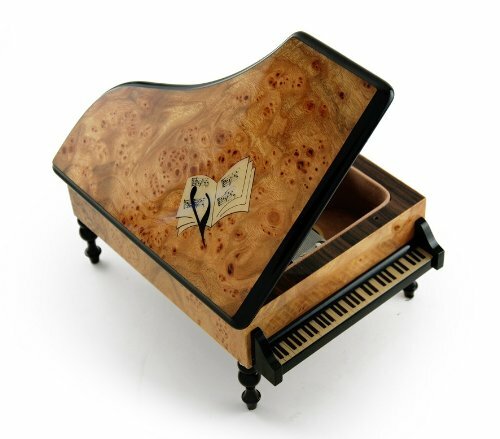 It's constructed of solid burl-elm and rosewood. Dimensions: Length - 8", Width - 6", Depth - 3.75 "